When I came to the states to work on the book project with Gina, I remembered that several years ago she told me about turducken. At first I thought this was a joke and didn’t really pay attention to it.Putting different birds into each other can be ok, but this all sounded too crazy, as we were talking about WHOLE birds! Anyway, my opinion is that this is such a crazy idea that it would occur only in the United States. That’s exactly what I love about this and it actually makes sense. Gina’s friends who are now my friends too, invited us to share Thanksgiving dinner with them. It was traditional and marvelous, but no turducken. Since one of Gina’s friends had to work on Thanksgiving day and the day after, we invited her and her family to join us on Saturday for a Thanksgiving dinner. Yes, this was finally my opportunity to tackle a turducken.I love a challenge and this was it. We took photos as proof that such a thing exists, because my friends in Europe and Iceland would never believe otherwise. So here I publish for everyone who might be interested, how I did this monster bird thing that everyone loved at dinner. I did it “my way” as Frankie Boy would say, meaning I didn’t follow any recipes. When my kids heard of this and saw the pictures, they insisted that turducken be served at our New Years dinner in Iceland. And so it will. Enough talking. Please try this at home but to make it easier than it was for me, ask your butcher to bone-out the birds for you. Totally de-bone them, but the keep the lower legs and lower wing bones on the turkey, as we want the whole turkey-thing to look like a “normal turkey” when served. PS. The tradition is to fill the duck with the chicken and then stuff the duck into the turkey.In this case the chicken was bigger than the duck, so I just decided to layer everything. 1. Totally bone out all of the birds except the turkey, where you save the lower part of the legs and the lower part of the wings. 2. Cut a piece out of each breast and use it to cover any gaps. Season the meat. 3. 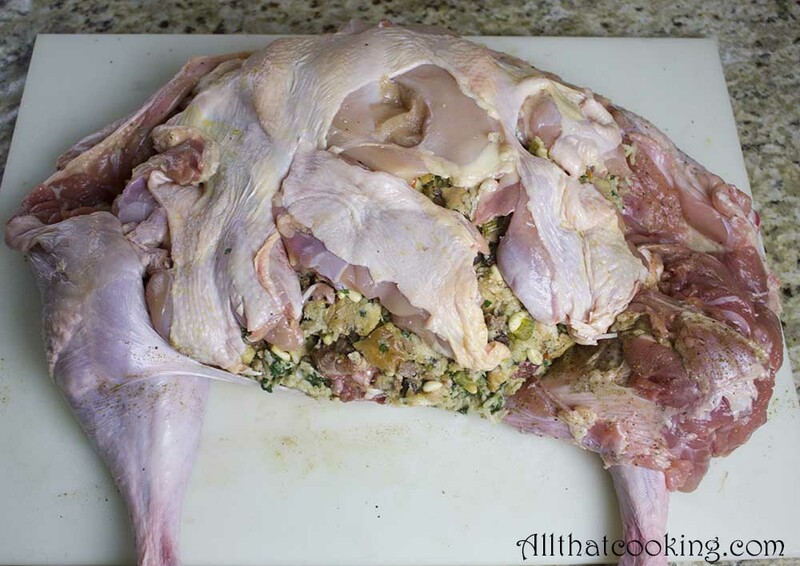 Spread stuffing evenly over the turkey. (This is the rice/spinach stuffing.) Place the duck on top then season. 5. 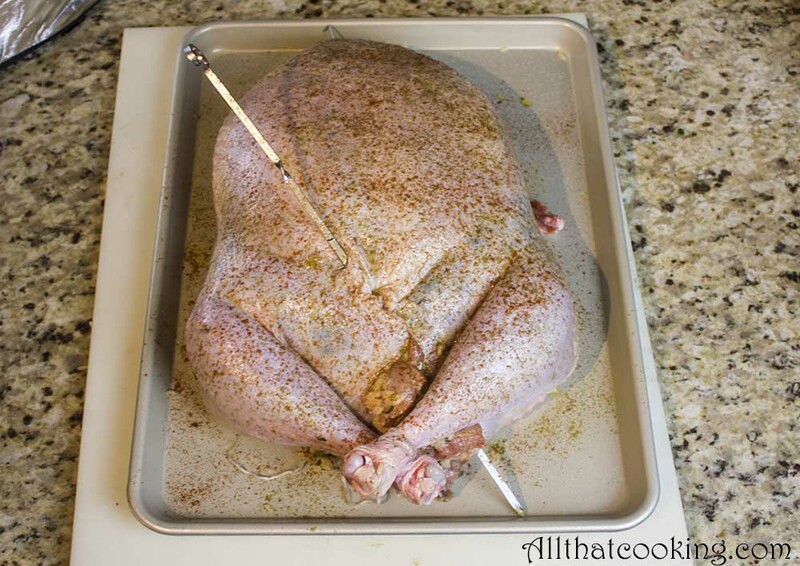 Next lay the chicken on top and spread everything so it’s laying evenly on the turkey. 6. Put the sides together and sew or weave a long pin through the skin so you seal and close the bird. I used a metal skewer. 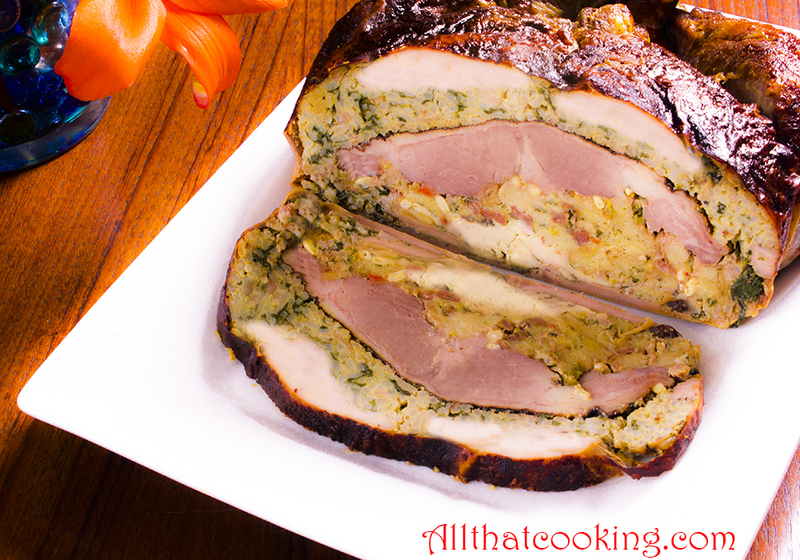 You might need a helping hand here to hold the turducken while you close it up. 7. 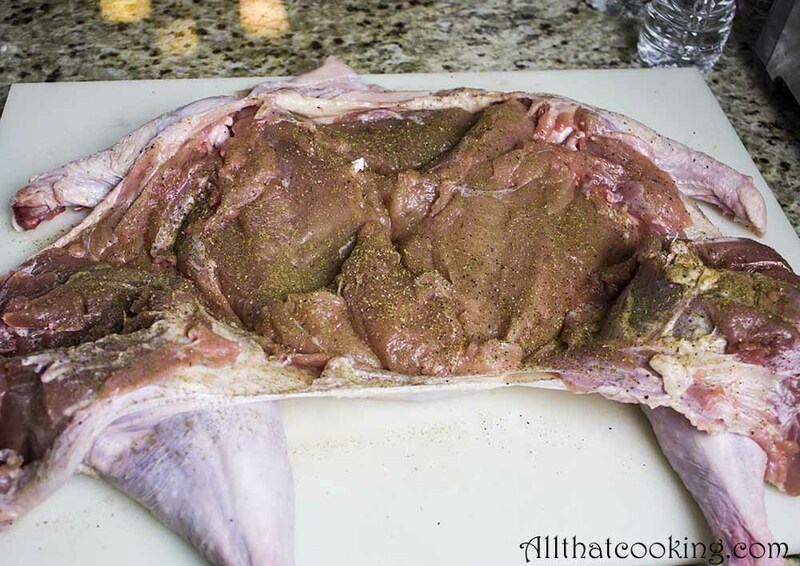 Rub the turducken with olive oil or room temperature butter. I used olive oil. 8. 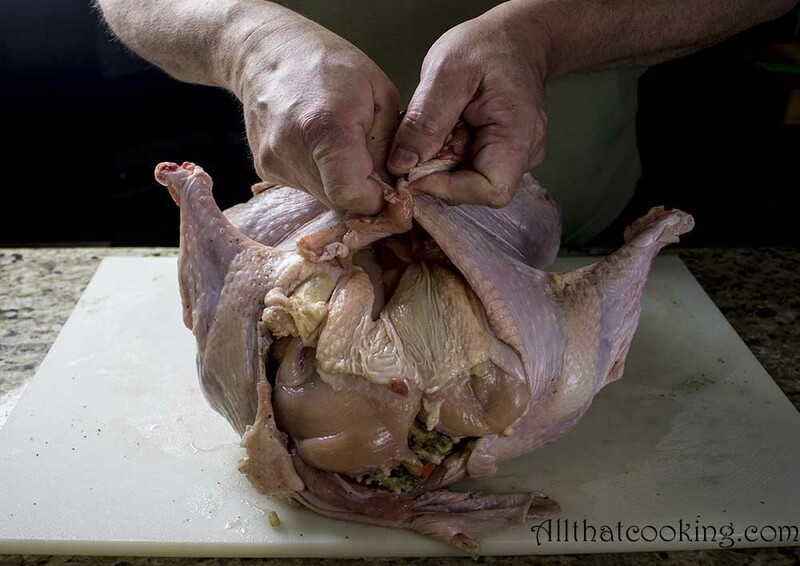 Carefully turn the turducken right side up. Seal the gap with another pin and tie the legs together. 9. Bake at 200F for 9 hours. 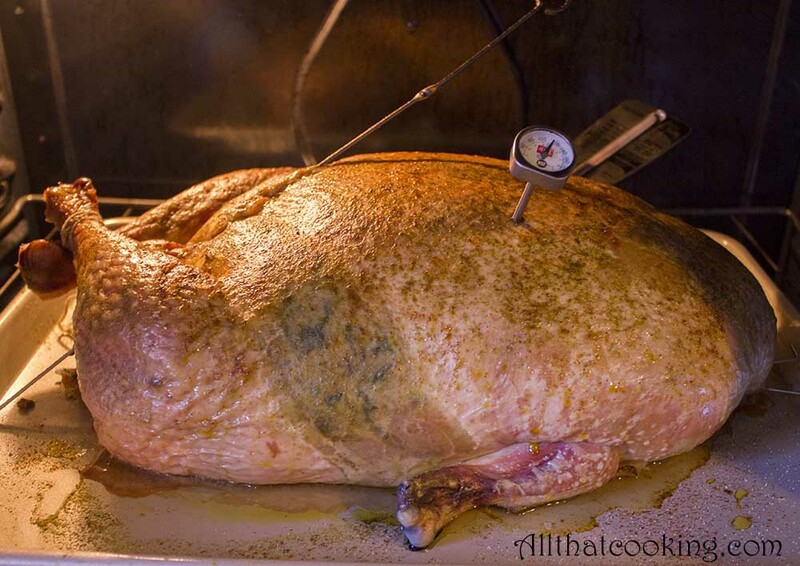 During the last 30 minutes of baking increase the oven temperature to 350 F. Make sure you have a meat thermometer in the center of the turducken. 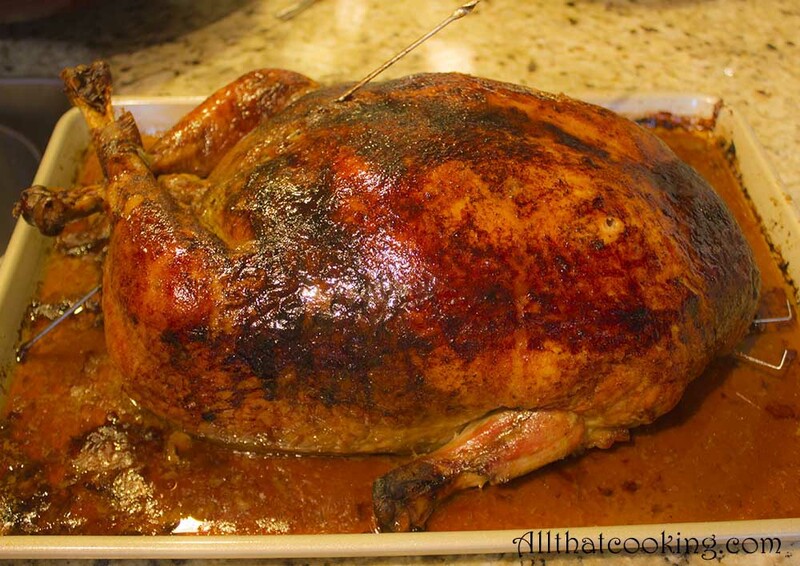 The turducken is done when the temperature reads 170 F.
10. 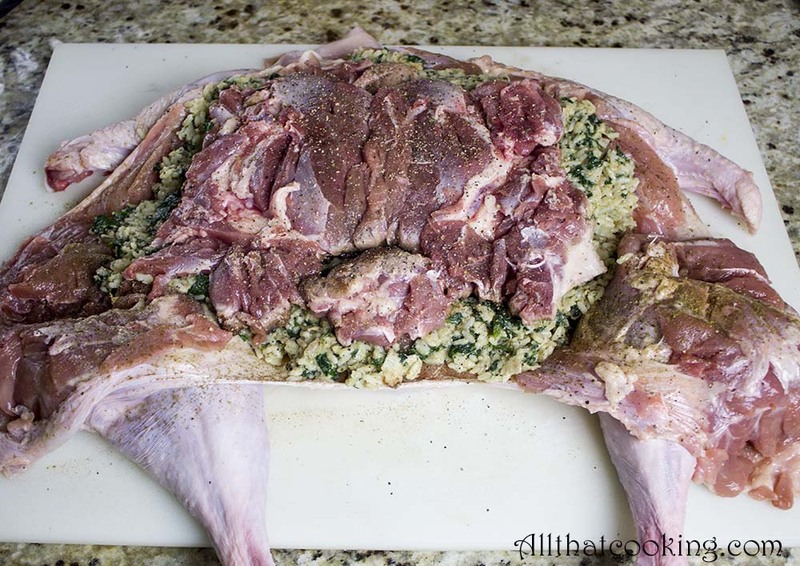 Cover and let the turducken rest for at least 30 minutes. This is to keep in all of the flavorful juices. 11. Cut a slice and see how you did. This looks nice and smells even better – believe me. Serve with mashed potatoes, gravy, mashed and sweetened sweet potatoes topped with marshmallows, salad, and Gina’s sweet cranberry thing. A Charlotte is the perfect finish for a turducken dinner. It always lights up the female faces. 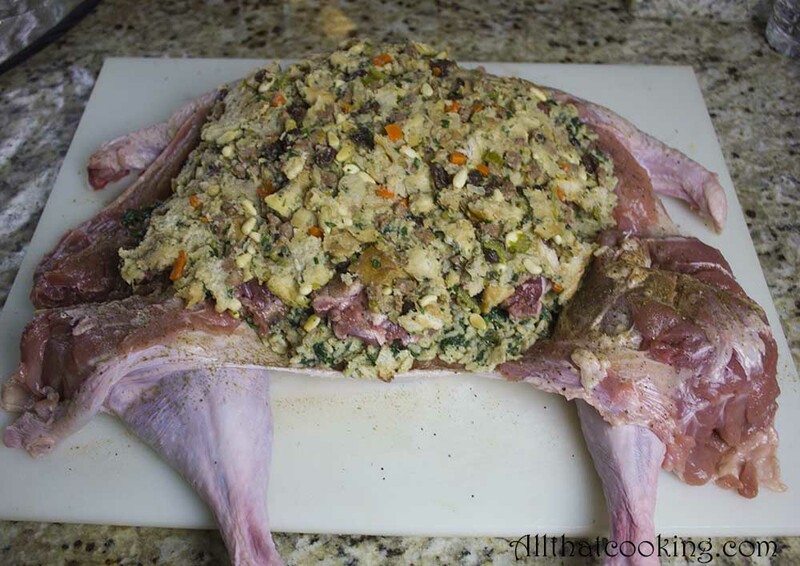 Gallery | This entry was posted in Main Dishes and tagged chicken, duck, Thanksgiving turducken, turducken, turkey. Bookmark the permalink.
. . . and a good time was had by all. Thanksgiving Saturday was a big hit thanks to Oli. Wonderful story! but 9 hours? Steinar and i will consider to try this out next Thanksgivingday. This dish is a labor of love. 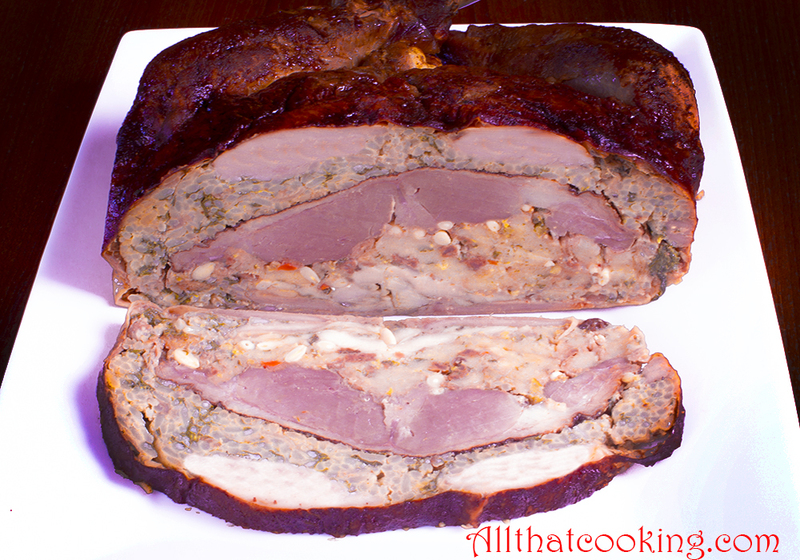 The stuffing and meat slices look delicious, the step by step process was helpful. Loved the story Olin. The blog is amazing. You and Gins should be very proud. What's next????? Patti of Nashua, NH…..Loved the Thanksgiving poem. That is my comment above. Finding commenting difficult on kindle. Don't know what "select profile" is so I am having difficulty commenting. 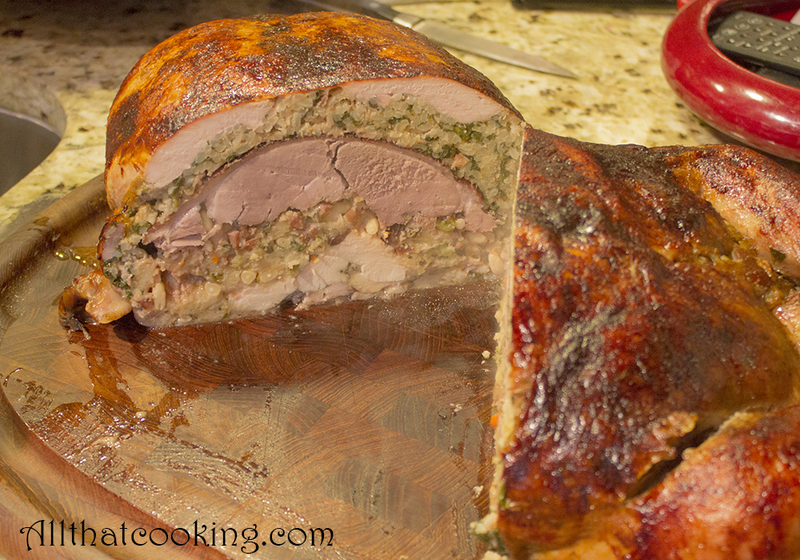 The photos of the turducken were excellent…looked delicious. Nice job GINA and OLI!!! rjupa / ptarmigan may have a strong taste due to the buds they’ve been eating. Thanks for stopping by. 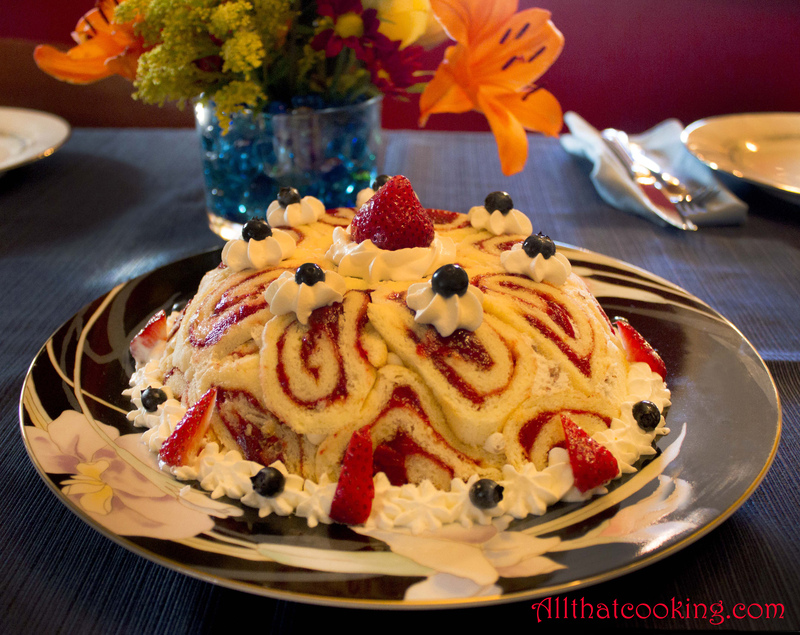 It IS a project, but a fun one with delish results. Our dinner guests still talk about Oli’s turkucken! That turducken is a MASTERPIECE! Oh, thanks! It was a bit of work, but we had to try it at least once!